Incorrect data (e.g. Pokemon with the wrong abilities listed, moves with the wrong power/type and so on). Missing pictures (sprites, icons and artwork). As I fix the errors, the answers will be hidden. Try and keep comments to a minimum to avoid clogging up the page, stick to important things like additions/corrections to the corrections. Remember, small corrections only! Please stop me if this is just me misunderstanding the format of the egg-move section, but in Onix's egg-moves, it says that Bronzor, Bronzong, Golurk, and Dhelmise can pass on Heavy Slam to Onix. This is impossible, as said Pokemon are genderless and can only breed with Ditto. There are also a few all-female parents listed in egg group pages, like Murkrow punishment. Aren’t there some Pokémon that are in certain egg groups but can’t breed? Like Metagross being in the mineral group? Technically Metagross can breed with Ditto. The problem here is that Pokemon can pass down egg moves only if they can be male, and they can breed with females from other evolution families. I have decided to post all minor errors that I found in one post. In Emerald, the TM11 sunny day, TM19 giga drain, and TM31 brick break can be obtained at Trainer Hill. The page about defiant should probably specify that the physical attack goes up 2 stages. Competitive activates when the ability user's stat is lowered, not when it's targeted by a move. So it doesn't activate for missed moves but does activate for things that aren't moves, like intimidate. Spook, according to Bulbapedia, "Although Contest conditions are a hidden stat in Pokémon FireRed and LeafGreen, Pokémon HeartGold and SoulSilver, Pokémon Black and White, Pokémon Black 2 and White 2, and Pokémon X and Y, a Feebas that has maximum Beauty will still evolve in these games. The Prism Scale, introduced in Generation V, was created due to the fact that there is no legitimate way to raise the Beauty of a Feebas created in the Generation V games, whereas with FireRed and LeafGreen, a trade to Ruby, Sapphire, or Emerald was all that was required, and a haircut or grooming by Daisy Oak or the Haircut brothers is all that is required in HeartGold and SoulSilver." Get your facts straight. Bulbapedia is correct BY DEFINITION. Fixed all the rest of these now, thanks for reporting! You didn't fix the serene grace error. Also, I added a new one. Serene Grace doesn’t affect the items in gen 3-4 as far as I’m aware. Do you have a source that says otherwise? It's only after Generation 4. Nevermind. On the EV page, it says that if an EV-reducing berry is used on a Pokémon with over 100 EVs in the corresponding stat, it will drop the EVs down to 100, and then reduce 10 EVs per berry from there. However, this in only true in Generation 4; in Emerald and Generation 5 onward, they always reduce the corresponding stat by 10. I've fixed the Photon Geyser link (and removed it from your answer). Starting in Gen V, Baton Pass no longer passes the effect of trapping moves such as Mean Look. Baton Pass, Volt Switch, and U-turn are not blocked by trapping effects (this is not mentioned in their current descriptions). The page with unavailable Pokemon in Pokemon shuffle says that Sandygast is not available even though I have it. I think I got it through the safari so that’s why. It adds new Pokemon every week. And I think that’s why it wasn’t updated. And also deoxys formers appear in expert stages and alola marowak was there once too. Yes the Shuffle page has not been updated in a long while as I stopped playing. I'll get around to updating it some time! I have been going through every move in Pokemon recently, and I have found a confusing conflict of information between this site and all others. After You forces the target to attack first in the next turn. It can be targeted at opponents or team-mates. Your version seems to imply that After You affects the targeted Pokemon by making it move first next round, rather than immediately after the user of After You. Having not used the move, I cannot say that your version is incorrect, but I suspect that every other site having the same wording means that their version is correct. After You forces the target to attack next in the current turn. It can be targeted at opponents or teammates. I think that Flying Press is supposed to be able to hit Pokemon on the opposite side in a Triple battle, but other sites are inconsistent at reporting this, so I only have Bulbapedia (and I think Serebi, but their site is hard to read) as a source. Could someone confirm/refute this one? Focus Energy's Effect is not clear as to its effect, and is inconsistent with other effects on the site. It should be reworded as "Increases user's critical hit ratio by two stages". Also, page should note that this was increased from +1 in Gen 2, as well as noting that in Gen 1, Focus energy was supposed to be x4, but was instead divide by 4. Foresight's Effect claims that Ghost-types can now hit Normal types, but all other sites seem to say that's not the case. Also, some sites claim that Foresight's effect doesn't end until the target is swapped out, but I cannot confirm this. Can someone also confirm/refute this one? Gear Up's Effect is copy/paste of its move description, and is inconsistent with the rest of the site. A way to word this to match the rst of the site would be as follows: "The user targets all allies, including itself, with the Plus or Minus Ability, and raises their Attack and Sp Atk by one stage each." Aromatic Mist raises the Special Defense stat of a target ally Pokémon by one stage. This seems to be corroborated by the flavor text, though I once again haven't used this move. Strangely, this site also claims the move to be able to target adjacent foes, which seems strange given the flavor text and effect of the move. This page also ignores that in Gen 1, the disabled move was chosen at random from the Pokemon's movepool. Fairy Lock's move target is listed as "single Adjacent Pokemon", but should be "Affects all Pokemon including user"
- The user deals damage and lowers the target’s Defense stat by 1 stage. Fissure's Effect claims that the move is "more likely to hit a foe of a lower level than the user", and "Fissure will fail against a target Pokémon at least 30 levels above the user". This is incorrect, as Fissure and all OHKO moves automatically fail if the foe is higher level than the user. Floral Healing's Effect is not clear concerning the effects of grassy terrain. Instead of saying "It restores more HP when the terrain is grass. ", it would be better to read "When the terrain is grass, the HP restored is increased to 2/3 its max HP." Heal Block says it can target All Foes, rather than All Adjacent Foes. That said, with only 2 other sites saying otherwise, I'd check in-game before making this change. Helping Hand's Effect simply says it "boosts the power of the partner's move" without explaining what that means. A more informative explanation would be that it "increases the power of the partner's move by 50%"
On the "All Moves" page https://pokemondb.net/move/all , Hidden Power's Effect says that the move's power is dependent on the Pokemon's IVs, which hasn't been the case since Gen 6. High Horsepower's Effect is just copy/pasted from its move description, and is inconsistent with other moves on the site (and isn't even an effect). A more consistent Effect would be "The user deals damage and has no secondary effect"
Ice Hammer's Effect is just copy/pasted from its move description, and is inconsistent with other moves on the site. A more consistent Effect would be "The user deals damage and lowers the user's Speed stat by 1 stage"
Leafage's Effect is effectively a copy/paste of its description, and is inconsistent with other moves on the site. A more consistent Effect would be "The user deals damage and has no secondary effect"
Liquidation's Effect is just copy/pasted from its move description, and is inconsistent with other moves on the site, as well as not including information on the percent chance of the effect. A more consistent Effect would be "The user deals damage and has a 20% chance to lower the target's Defense stat by 1 stage"
Lunge's Effect is just copy/pasted from its move description, and is inconsistent with other moves on the site. A more consistent Effect would be "The user deals damage and lowers the target's Attack stat by 1 stage"
Hey just wanted to say thanks for all these posts. I'll try and get them updated when I can. Magnetic Flux is in dire need to be revised. Magnetic Flux raises the Defense and Special Defense of all ally Pokémon with the Plus or Minus abilities by one stage, including the user. Memento's Effect is a bit poorly worded, and not up to the same standard as other Effects. A clearer description would be "The user of this move faints, lowering the Attack and Special Attack of the target by 2 stages as it does so". Note: this is sort of similar to another post from 4 years ago, where you said you'd expand this move's Effect, so I guess this is also a reminder. Mist's Effect is a bit poorly worded, and not up to the same standard as other Effects. A clearer description would be "The user and its allies are protected from stat reduction for 5 turns". 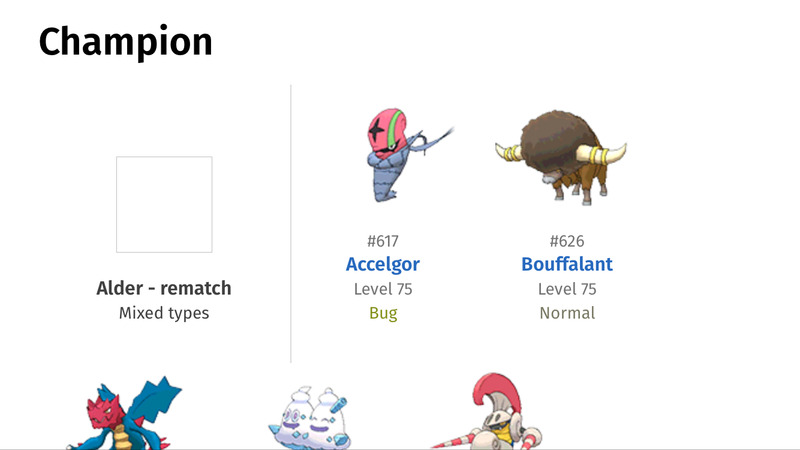 In addition, the Effect on the moves page https://pokemondb.net/move/all should be changed to "User and its allies' stats cannot be changed for 5 turns." Pollen Puff's Effect is a copy of its description and does not give great details on the effect toward an ally. An improved Effect would read as such "Pollen Puff's effect depends on which Pokemon is targeted. If it targets a foe, the user deals damage and has no secondary effect. If it targets an ally, the user heals the target for up to 505 of its max HP"
The user recovers HP based on the weather. Note: This correction is similar to another made 4 years ago. For example, if the Pokémon used Dragon Dance and Double Team once each, that is a total of 3 stat increases (+1 Attack, +1 Speed, +1 Evasion) and Power Trip's base power will be 20 × 3 + 20 = 80. Prismatic Laser's Effect is a copy/paste of its description and does not match the quality of other descriptions on the site. An improved description would be "Prismatic Laser does damage, but the user must recharge on the next turn. (Enter) If the attack misses, the move is blocked by immunity due to Protect or Detect, or the move fails to damage due to type immunity, the recharge turn will not occur." Psycho Shift's Effect is a bit sparse, and should probably be expanded to something like "The target gains the user's status condition, then the user is cured of that condition." Other sites also mention the move only affecting non-volatile status moves, and the move failing if the target already has a non-volatile status move, but I've not used the move personally, and couldn't find enough sources to confirm this. Will need to be investigated further. Purify's Effect is a copy/paste of its description and does not match the quality of other Effects on the site. An improved wording would be something like "The target is cured of its status effect, and the user regains up to 1/2 its max HP. The move fails if the target does not have a status effect." Similar to Psycho Shift, other sources say this must be a non-volatile status condition, but additional research is needed for that. Relic Song's Effect is worded strangely compared to other Effects. To better match other moves, I would suggest rewording it to "The user deals damage, and has a 10% chance to put the target to sleep"
"Spectral thief steals the target's stat boosts, then deals damage. if the move misses, no stats boosts are taken." Other sites mention that stat boosts taken are taken only up to +6 (for example, If Marshadow has +1 Attack, and Charizard has +6 Attack, Spectral Thief will result in Marshadow taking +5, leaving itself with +6, and Charizard with a +1), but I could not corroborate this. Also, notes on the effects of abilities such as Simple and Contrary should be added (since Abilities aren't my specialty, I'll leave that to someone else). Revenge's Effect is very simple and does not match the quality of the other effects on the site. A better wording would be "If the target has already hit the user this turn, the power of Revenge doubles"
Shadow Bone's Effect is a copy/paste of its description and does not match other Effects. A better wording would be "The user deals damage and has a 20% chance to lower the target's Defense by 1 stage"
Shell Trap's Effect is almost copy/pasted from the description and does not well convey the move's Effect, A better Wording would be as such: "Shell trap sets a trap before any target moves, and the user is set with a -3 priority. If a target hits the user with a Physical attack before the user moves, the target is dealt damage. (Enter) if no target hits the user before its turn, the move fails. Shore Up's Effect is a copy/paste of its description, and does not match the quality of other Effects on the site. An improved wording would be something like "The user regains up to 1/2 its max HP. (Enter) If Shore up is used during a sandstorm, the health regains increases to 2/3 its max HP." Sky Uppercut's description is a bit bare and doesn't really make clear what the move's effect is. An improved wording would be "Sky uppercut hits the target, including during the semi-invulnerable phase of moves such as Fly, Bounce, or Sky Drop"
Smart Strike's Effect is copy/pasted from its description and does not fit with others similar to it. A better wording would be "Smart Strike deals damage and bypasses Accuracy checks to always hit. However, it will not hit Pokémon during the invulnerable stage of Bounce, Dig, Dive, Fly, Shadow Force or Sky Drop. "If the user's previous move failed to deal damage, the move's power doubles. Additional details would need to be included about the effects of moves such as Protect/Detect, and whether the move triggers from moves such as High Jump Kick. As these are not my strong suit, I will leave this section to others. Spotlight's Effect is copy/pasted from its description and does not match the quality of other Effects on the site. A better wording would be "The target becomes the center of attention, causing all other moves to target this Pokemon. This move overwrites other effects that cause redirection, such as Abilities like Lightningrod or Moves like Follow Me. The move has priority +3, so it will activate before most other moves." Strength Sap's Effect is a copy/paste of its description and does not reflect the quality of other Effects. An improved wording would be "The user restores its HP by the same amount as the target's Attack stat. The target's Attack stat is then lowered by one stage. (Enter) Strength Sap is still usable even if the user's HP is full, and the Attack stat will still be lowered. However, the move will fail if the target's Attack stat has already been reduced fully (-6). Additionally, effects of Items like Big Root, abilities like Liquid Ooze, and moves like Mist will need including, but as this is not my specialty, I will leave it for others. Struggle's Effect is out of date as of Gen 4, and should be updated to account for it only attacking foes, for it bypassing accuracy to always hit (ignoring semi-invulnerable states). and always dealing 1/4 of user's max HP as recoil. A correction to cover all this goes as follows: "The user deals typeless damage, but takes recoil damage equal to 1/4 of its max HP. Struggle is automatically used when no other move is capable of being used, either due to all moves having 0 PP, or due to the effects of other moves such as Disable. Struggle bypasses accuracy checks to always hit, except for during semi-invulnerable stats such as Fly or Dig. (Enter) Changes: (Enter) In Generations 1-3, Struggle dealt recoil damage based on the amount of damage dealt to the target. In Generation 1, the recoil damage equal 1/2 damage dealt, whereas in Generations 2-3, this was decreased to 1/4 damage dealt. (Enter) In Generation 1, Struggle had an accuracy of 100%. (Enter) In Generation 1, Struggle dealt Normal-type damage"
Taunt's Effect does not enumerate how long the move lasts, and also uses "opponents" instead of "targets". An improved description would be along the lines of "The target is barred from using status moves. The effect lasts for 3 turns if the user goes before the target, and 4 turns if the target goes before the user." Tearful Look's Effect is a copy/paste of the move's description and is very sparse on the move's effects. A better worded and expanded description would be "Lowers the target's Attack and Sp. Attack stats by 1 stage each. (Enter) Tearful Look bypasses accuracy to always hit, except during semi-invulnerable stages of moves like Dig or Fly. Tearful Look will even hit through Protect or Detect." Toxic Thread's Effect is a copy/paste of its description and does not match the quality of other Effects on the site. An improved wording would be "The target is poisoned, and the target's Speed stat is reduced by 1 stage." Twister's Effect claims it has a 30% chance to cause Flinching, but other sources and the "All Moves" page say the move has a 20% chance. Venom Drench's Effect on the "All Moves" page https://pokemondb.net/move/all fails to note that the move affects Attack, and just says Sp. Attack and Speed. Water Sport's and Mud Sport's Effects both say the type's damage is reduced by 50%, rather than 67% damage. Wish's Effect is very sparse and does not really cover what the move's effects are. An improved/expanded wording would be "The user makes a wish for healing. At the end of the next turn, the pokemon in the user's location will be healed by half the user's maximum HP." Zing Zap Effect is copy/pasted from its description and does not match the quality of other effects on the site. An improved description would be " The user deals damage and has a 30% chance of causing the target to flinch, if the target has not yet moved. (Enter) Pokémon with the ability Inner Focus or those behind a Substitute cannot be made to flinch. Pokemaster edit: the DexNav Pokemon for Hoenn do not specify when they're post-National Dex. Hello, im currently playing Pokemon omega ruby, and im using your web site to find information on Pokemon in every area (like I've always done), and im sorry to say but i think you made en error in the site, because most of the Pokemon, you right you can find, you can't actually find. It's so frustrating, pleas let me know if it's just me that's blind or if it's you that made a mistake. this is not a complaint, just a heads op. Could you provide some examples? Note that there's a probability of each pokemon appearing - some appear less than others. of course, on route 101 it says that, with the DexNav, you can catch, Lillipup, Zorua, and Sewaddle, well I've looked on that route extensively, and i'm telling you the only pokemon you can catch with the DexNav on that route is Zigzagoon, Wurmple and Poochyena. Your site even says that Zoura and Sewaddle is common pokemon in that area and i'm pretty sure none of them is in the game. That's because those Pokemon are only available in after you get the National Dex, the site just doesn't specify that. After you get it, a ton of new Pokemon start appearing on the DexNav. So it's actually correct, just a bit vague. Other sites like Bulbapedia say the exact same thing (see http://bulbapedia.bulbagarden.net/wiki/Hoenn_Route_101#Generation_VI ). Thanks for bringing this up though! Oh! great! got it as the last thing last night so i havent tried it yet, cant wait.! > In Pokémon Platinum, HeartGold and SoulSilver, you can find out what type Hidden Power would be for any Pokémon by showing it to a man in the game corner Prize Exchange building (Veilstone City for Platinum, Celadon City for HG/SS). Is there information on moves you get by transferring Pokemon from Colosseum or XD? Munchlax/Snorlax can be found in Ultra Sun and Ultra Moon on Route 1, the same place as Sun and Moon. Their pages say you can only get them by migrating, and the Route 1 page doesn't have them for the Ultra games. In fact, Route 1 has a few pokemon missing for the Ultra games; Bonsly, Pikipek, Happiny, etc. The information for Parental Bond is incorrect. This site displays it as the second attack, done by the baby, deals 50% the damage of the mother. From Gen 7 onwards, it got nerfed down to 25%. Suggestion: Poké Test for new members? Should we make a rule against posting errors outside the minor errors question? Post any problems with the new design here! Why is Mega Sceptile not categorized under Dragon-type Pokémon on the corresponding page on this site?